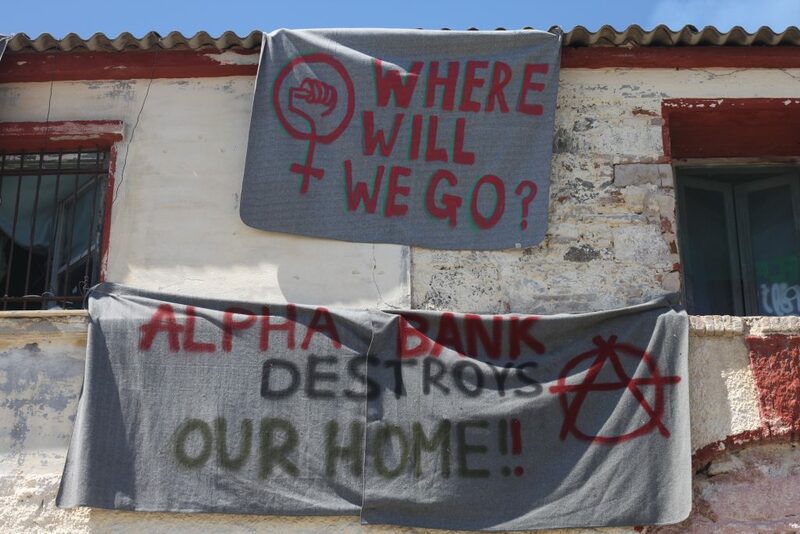 Yesterday one of the squats we supported was taken away by the cops and the Alpha Bank and turned from a home into an old abandoned unused building again. All people were arrested and detained for a day and might face charges for trespassing and destroying of property. Now many people are out on the street, with no safe place to go. What happened yesterday leaves us sad and incredibly angry. What was destroyed by the state and capitalism was not just a building. It was a home. It was a community. It was a place for friendship, for solidarity, for struggling together against this border and this system that creates them. The squat was not a perfect place. There was always rubbish lying around, the sound of the power factory next door was the lullaby and the toilet was rarely cleaned. But still we loved it. Yesterday we were awaken at 7 a.m. as the police kicked our doorsover and over. When we came out of the rooms there were numerous policemen, regular city police and OPKE in the yard. For the three days before we already watched workers turning this home into a jail so the eviction didn’t come as a complete surprise. 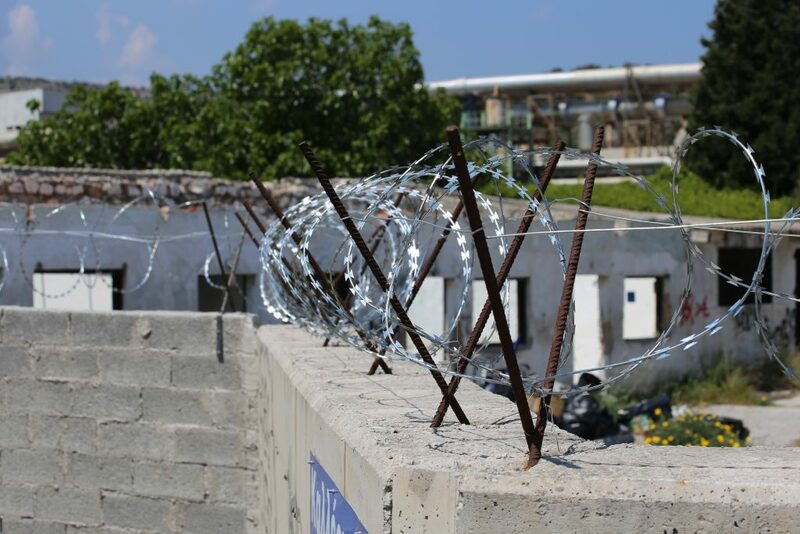 Each day workers would continue the razor wire around the wall of the squat we supported and lived in while we were trying to decide if there was anyway to resist. At the time of the evictionwe were were around 35 people in the squat and all were gathered in the yard. The segregation and racism began immediately as people that looked like “refugees” had to gather in one corner of the yard and everyones papers were checked and taken by the cops. Then people they considered “Europeans” or people with passports were also asked to give their passports. Some refugees were handcuffed to each other for no apparent reason. We tried to resist the separation but those who insisted on staying were pushed and dragged away. All people with western passports were taken into an arrest van and brought to the police station. We were made to sit down on a corridor and were given contradictory information whether they were arrested or taken for ID control only. When we were waiting we saw that the refugees were also taken to police station. They were all put into cells while everyone with a western passport was kept in the hallway. After hours of waiting we were informed that we all are accused of vandalism and trespassing. Everyone of us was taken into an office and we were asked to sign papers written in Greek. Only oral translation into English was provided and we had to ask repeatedly for a complete oral translation of the documents. Also everyone had their fingerprints and pictures taken. At around 7 in the evening the last person was released from the police station. When the police let us go they didn’t inform us if we are charged or not. Still it is unclear what will happen now, if we all will face court or not. We left the police station with relief and happiness to feel the sun warming our skin and to see the faces of all friends that were welcoming us outside. The relief stayed only a short while. The eviction left dozens of people out without shelter, without any safe place to go. 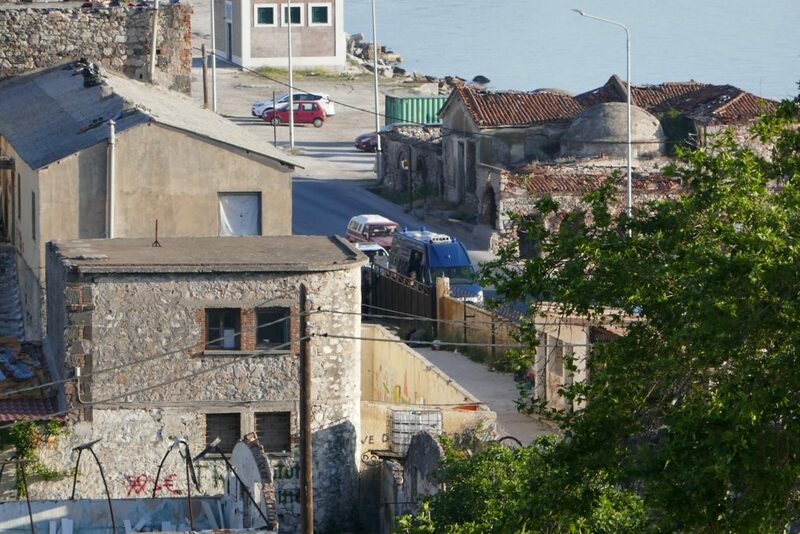 What was a home is now an empty building surrounded by NATO wire and guarded by securities. This eviction didn’t come as a surprise. In the last four months the repression on refugees, especially people without valid papers and from certain nationalities, as well as solidarity movements has become worse each week. The destruction of any autonomous spaces for people to live was expected. Many friends we support living out of the camps have been checked and arrested in the last months. There have been many steps taken in order to clear the streets and the city of refugees and keep as many people as possible within the confines of Moria camp. They were tightening security at Moria, police presence on streets became stronger, many people are and were detained during their asylum procedure, deportations happen on a regular basis and so on. This time it was Alpha Bank, the owner of the building, that had the power to cause the most damage to us. It was Alpha Bank who pressed charges against us and pushed this eviction. We are sure that the building will not be used. It is very old, in the ugliest spot in Mytilini next to a power electric factory billowing steam and chemicals and air and noise pollution. No one wants this building except those with no other option except the prison that is Moria. All of this also coincides with the announcement that all NGO and international groups will leave Lesvos by July 31st. As we are one of a handful of groups without government contracts working outside camps, the EU and Greek government would very much like to see No Border disappear from Lesvos. Unfortunately this eviction is not the end of a series of repression but rather its beginning. We expect evictions of the other remining squats in the next weeks and months. Furthermore we also expect the arrests, imprisonments and deportations to keep going. But we are not ready to give up. We will stay here, we will continue to support the people in their struggle for freedom of movement and dignity. We will keep fighting. We send a lot of Love and Rage to all people standing with us and fighting against all borders here on Lesvos and everywhere! None of us who were detained yesterday was informed by the police whether we will be charged or not. It looks like at the moment that we will all have a court in approximately 5 months for vandalism and trespassing. What used to be a place full of life is now only an empty building surrounded by NATO wire and guarded by security. We will keep you updated and a longer post about what happened yesterday will follow soon. Yesterday morning one of the squats was evicted. 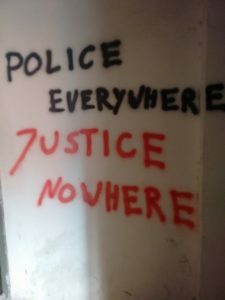 All of the people inside of the squat were taken to police station and detained for several hours. In the evening everyone was released. We expect two squats to be evicted soon. We hope it will take some more time but we have reasons to believe that at least one of the buildings will be invaded by the cops within a few days. Another eviction will leave dozens of people homeless or forced to stay in Moria camp. Also it is likely that the eviction will go along with the (attempted) arrest of as many people with rejected asylum applications and/or from the nationalities the EU assumes has no claim for staying in Europe. Our solidarity is stronger than their repression! Since yesterday 12 people are on hungerstrike in moria camp. 1 is from Syria and 12 Kurdish from Syria. Three of them await deportation to Turkey, their appeals were rejected which means they have basically no option to get asylum in Europe anymore. The others had their first interview rejected and are still waiting for their appeal do be decided. According to our information they didn’t take any food or drinks since yesterday morning. But still they are determined to continue and protest against the situation here in the island and the inhuman EU politics that create it. As most of you know it has been a difficult and changing time for No Border Kitchen in the last months. There has been violence and conflicts within the group as well as a a split between members of No Border Kitchen. As a result of the on-going conflict and as an attempt to move forward we have decided to ask one member of No Border Kitchen to leave the group and all organizing structures. We define our group with anti-authoritarian, anti-sexist, anti-fascist principles and acts. This has been hindered by a member who continues to act with violent, sexist, patriarchal and hierarchical behaviour. The decision was not made lightly. It has been a very difficult process and this process will continue as excluding one person does not solve all structural problems we are facing while working in No Border Kitchen. We feel it is important to communicate this information because we know that many groups struggle with conflict between members and often have to ask an individual to leave. We want to be honest about these problems and how we are finding solution for them. In the last months we were not able to have a group process and come to a decision because there were too many urgent concerns that took priority. We have learned now that if we are in conflict with the police and the Greek government and the borders we cannot be wasting time fighting our comrades. We will now be able support others better if we have solidarity and common principles within our group. To all the people who have been or are currently involved in NBK from outside Lesvos, please contact us with any questions. Police was coming today early in the morning to the squats. They came to the different squats one after the other with 3 cars and two arrest vans. In total 17 people were arrested, sixteen refugees and one person with European passport. In the squat where they went first two person were arrested. After they went to the other squat. There they arrested one European person and also kicked her during the arrest. Then they went through one of the building taking all the people from their rooms. All papers were checked and then the police took pictures of each person. At the same time other cops started to go to another building and to the beach were some people were sleeping. When one person tried to run he was severely beaten. He had to be transferred to the hospital for treatment. In the other buildings also people were arrested. All people were taken to Moria. 11 of them are still in the prison inside Moria. 5 people were released again today, 4 of the arrested refugees and the person with European passport. Some of the people that are now in Moria prison will be deported. We are incredibly sad and angry. Once again today our friends and comrades were imprisoned and beaten for no other reason than being in Europe without having the “right” passport. Now many face weeks or month in prison and after that deportation…for nothing. Only for looking for a safe place to live.